Every now and then, circumstances prevail and some thing, or event, or relationship falls perfectly into alignment and one can’t stop smiling for the satisfaction and joy said thing, event or relationship provides. 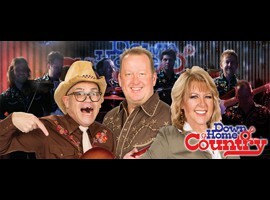 The redesigned, award-winning Down Home Country show is just one such experience that seems to have the performers, the set list, the wardrobe, the antics and the camaraderie with the audience perfectly and completely aligned. From start to finish, the song selections are unbeatable. The arrangements by Michael W. Davis, piano player extraordinaire, musical director, and happy vocalist are customized to showcase the extraordinary talents of the Grand Band. Most of the band has played together for quite some time, which is apparent in their easy-going banter amongst each other. Wayne Massengale, “Wildman” on the fiddle has a larger than life stage presence, with crazy antics and mad skills on the fiddle. His partner in crime, Larry Allred is an accomplished bass guitar player and zany contributor to the Down Home Country Show, with a hilarious video you’re not going to want to miss! The youngest in the band have a stage presence all their own. Chad Cathell, lead guitar, has a quiet but committed presence on stage and his guitar playing is spot on. Rob Blackburn, the youngest member of the Grand Band, really goes to town on the drums. Solidifying the Down Home Country sound is Gene Mulvaney, phenomenal on the steel guitar. So what about the lead vocalists? It’s hard to know where to start! Melody Hart, featured vocalist known as “the sweetheart of Branson” is the perfect blend of harmony, style, and fun personality on stage. And then you add her fiddle playin’ and great things happen. It’s definitely a crowd pleaser when she and her husband Wayne play twin fiddles. Thankfully this happens several times throughout the show. And then, much to the surprise and delight of the audience, a third fiddle is added when Jamie Haage, featured vocalist and emcee, joins in. Well known for his comedic persona “Jim Dandy”, a Branson favorite over the years, this show allows Jamie to set that persona aside and focus on his talents as a musician and vocalist. Since he emcees the show, his humor and comedic roots still shine. Especially with the likes of Jarrett Doughtery, who is the main comedian in the show. Jarrett introduces character after character to the audience throughout the show. It’s not easy to pick a favorite, but let’s just say that he is especially hilarious in a dress. The thing that stands out the most, aside from the great song selection, the talented band, the flow of the show, the darling outfits, and the perfect pitches are the smiles. Every performer was smiling. And not just flashy, fake stage smiles… genuine “I love my job”, “I love what I do for a living!”, “I am blessed!” smiles. The entire show will make you smile but the smiles and winks you receive from the performers on stage are what will really get you. Smiles are contagious. And free! And you get an abundance at the Down Home Country show. Reserve your free smile today!